The eLife website now has a dedicated section for plain-language summaries of the latest research. Today marks the launch of a new section of the eLife website to highlight research selected by our editors and described in plain language. 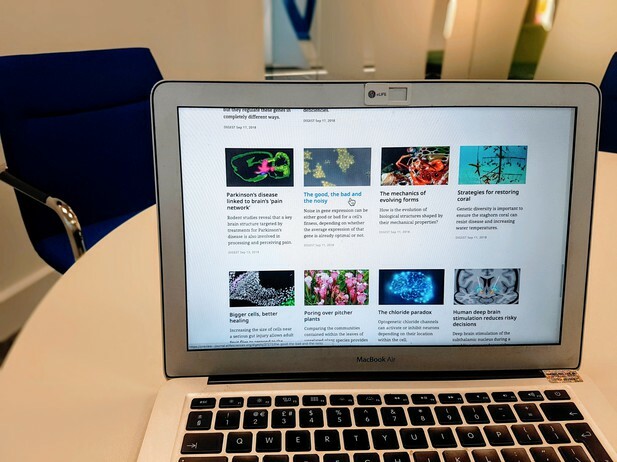 The section will bring the eLife digests from the latest articles together in one place, giving scientists and non-scientists alike an easy way to keep up to date with new discoveries published in eLife. So far, most readers have found eLife digests as part of the research articles that they summarise. Many digests later reached new audiences via the social publishing platform Medium. Now, all new eLife digests will also appear in the new section of our website. We hope this latest change will make eLife digests easier to find, especially for generalist readers who are interested in diverse topics across the life and biomedical sciences. Over 40 recent digests can already be found in the new section, including one discussing the oldest known fossil of a flying squirrel, and another that explains why people are more likely to digress in conversations as they age; more digests will be added as new research articles are published. We will continue to work to bring the latest research to the broadest audiences, and we welcome suggestions from all our readers. For researchers interested in writing about their science in plain language, our magazine editors have previously shared some advice based on experience working with thousands of scientists on eLife digests.